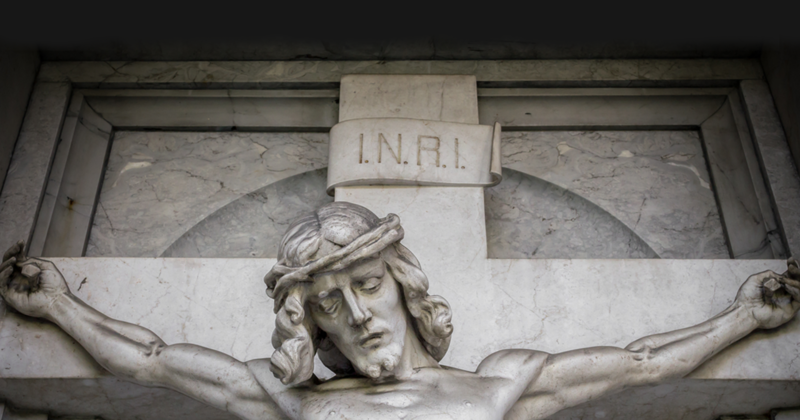 What Does “INRI” On The Crucifix Actually Mean? If you’ve ever looked at a Crucifix, chances are you most likely noticed the four letters “INRI” inscribed atop the cross. What does it mean, and why exactly is it there? The four letters are a titulus, Latin for label, inscribed above Jesus Christ on the Crucifix. They are the Latin initials for the phrase Pontius Pilate had written when he ordered Him to be crucified, as described in John 19:19-23. These words were “Iesus Nazarenus, Rex Iudaeorum” translating to English as “Jesus of Nazareth, the King of the Jews.” Latin uses “I” instead of the English “J”, and “V” instead of “U” (e.g., Jesus Nazarenus Rex Judaeorum). To answer the question of why Pontius Pilate had the phrase written on the cross requires knowledge of how ancient Rome meted out punishments. It was customary to set up over the heads of those sentenced to crucifixion a label indicating the crime for which they suffered and the name of the sufferer. This is why the Gospel of John refers to it as an inscription and Gospel of Mark 15:26 refers to it as the charge brought against Him. Pontius Pilate had condemned Jesus on the charge he was claiming to be the King of the Jews. The term Titulus Crucis, Latin for “Title of the Cross,” refers to the actual inscribed piece of wood that is a relic of the True Cross. During Saint Helena’s pilgrimage to the Holy Land, she brought with her a number of Church relics, including the Titulus Crucis. The Basilica of the Holy Cross in Jerusalem was built about AD 325 for her to house these relics. Sometime before 1145, the relic was placed in a box bearing the seal of Cardinal Gherardo Caccianemici dal Orso, who became Pope in 1144 as Lucius II. It was forgotten until February 1, 1492, when it was discovered by workmen restoring a mosaic, hidden behind a brick with the inscription Titulus Crucis. Today, it is again housed in The Basilica of the Holy Cross in Jerusalem. I never knew the inscription still existed! Amazing! Thank you so much for clarifying on that word. I read an interesting comment about the inscription made by a Jewish Rabbi. He said back in that time when people brought their lambs to be slaughtered for the Passover feast they would tie a label on it with their lamb to make sure they got their own lamb back. He said he always noticed on art work that there was always a sign at the top of the cross and the inscription was in 3 languages: Latin, Hebrew, and Greek. In Latin the first letter of each word is INRI, but in Hebrew, a language that doesn’t use vowels the inscription was YHVH. He pointed out that the letter v can be substituted for a w. YHWH…put the vowels in and it reads Yahweh. God put his name on his unblemished lamb for his family. I found that very touching and interesting. It is a simple as it is. It show the truth. Jesus did die for us on the cross. This was the head mark of his cross marking his crucifixion in titled by Pontus Pilot no less. This man was the King of the Jews. This was his cross, he was here. This his his proof. YHWH means Yod He Waw He that comes from the latin word of SATOR Hod He Vau He… God He Vow He was the original of it because G is pronounced as H, How do they mean Yahweh? YHWH was how the Jews abbreviated ‘Yaweh’ (Cf. The ‘Divine Tetrahedron’) which was a religious secret and not ever pronounced even in public worship without ringing a bell (or gong?) to drown out the sound but for many adding the vowels would be sacrilege against the commandment not to take Lord’s name in vain. If you are cynical you may call it a coincidence, or malice on the part of Pilate (Cf. the Roman Ensigns in addition to the Biblical report of him mixing the blood of worshippers with their own sacrifices) who loved to provoke the Jews but AFAIK it has to do with ‘Sator’ just the abbreviation of the formal charge against Jesus (Y’shua in Hebrew) as INRI is Iesu… in Latin. “What I have written, I have written” Pilate was a typical Italian. As an Italian I’m saying that. It was his F’ off statement to the Sanhedrin. Like wearing a red dress to a funeral (my great-grandma actually did that). He didn’t want to crucify Christ, Jesus was no threat to the Romans. Everyone back then was claiming to be a child from a god. Lus Jesus didn’t preach sedition, “render unto Ceasor.” Pilate was having a quiet day. The Sanhedrin started yet another riot in the streets. They blackmailed and threatened him to kill Christ, knowing Caligula was a nut and would kill Pilate if there was one more issue. So Pilate does what they want, washes his hands of it and rubs their faces in it for all time.